An ideal pack created to protect tree pits from gathering litter but most importantly allowing the water to drain directly to the tree roots beneath. 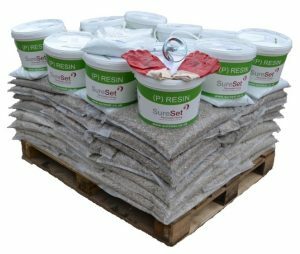 Each Tree Pit TradePack is delivered on a pallet and provides a sufficient quantity of SureSet aggregate and resin to install a 10m² area at a depth of 40mm. Prices start from £725.00 including UK delivery, excluding VAT. A PatioPack allows you to easily create areas around your home and garden to relax, play or socialise in with friends and family. Each standard PatioPack is delivered on a pallet and provides sufficient SureCell (a sub-base), natural aggregate and resin to install up to 12m² at a 24mm depth. Prices start from £775.00 including UK delivery, excluding VAT. These prices do not include SureCell aggregate infill. 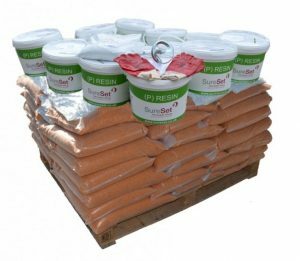 In response to the growing demand for our SuDS compliant grid structure sub-base in a format for builders to install on their own projects, SureCell® is also available in a convenient TradePack. One SureCell TradePack, sufficient to install an area up to 36m², is delivered on one pallet (gravel is not included). Including UK mainland delivery, prices start at £518.40 excluding VAT. Drawing on the benefits of our resin bound technology each TradePack contains 6mm sized bagged aggregate and resin sufficient to install an area of 30m² at a 16mm depth or an area of 26m² at an 18mm depth. 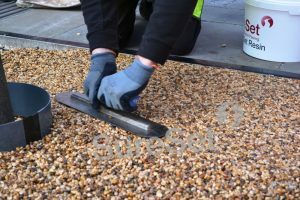 Delivering a permeable, durable, UV stable, low maintenance surface with no loose stone, TradePacks are available in our most popular colours; Sterling, Norwegian Pearl and Chestnut. 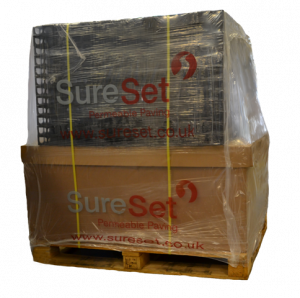 Delivered palletised and shrink-wrapped, including UK mainland delivery, prices start from £800.00 excluding VAT. Each standard TradePack comes with a 40 litre bucket and paddle whisk attachment (drill not included). We developed SureSlab Perma to provide landscapers, architects, developers and contractors all the benefits of our permeable resin bound gravel in a standard 500 x 500 x 40mm slab format. Manufactured by us, using our proven resin bound technology, SureSlab Perma is ideal for paths, patios, pool surrounds, seating areas and garden features; it is easy to cut, making laying a fast and straight forward process. Custom made for each order, each is available in our complete range of colours. They are durable, UV stable, resistant to frost and oil damage and aid slip resistance: providing an ideal surface for pushchairs, bicycles and wheelchair users. 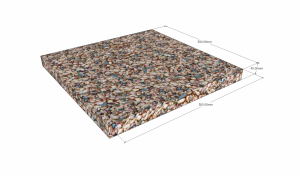 Prices are dependent on the type of aggregate and number of SureSlab Perma you require. Please contact us for more information. You can now purchase our 3mm loose recycled glass in quantities between 20kg to 5000kg (metallic and pearlescent colours are not available). Order quantities over 60kg will be delivered palletised. Prices start at £0.69/kg (depending on quantity ordered) and exclude VAT and delivery. T&C applies. For more information about any of our Supply Only products please contact us.